Jewish Leadership faction head: homosexual culture weakens the family – without which there is no civilization. 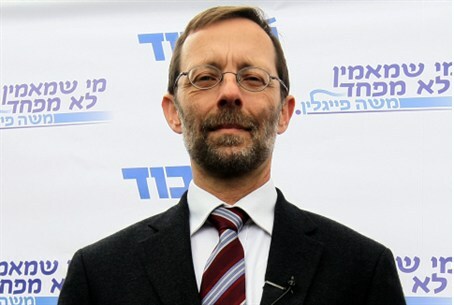 Moshe Feiglin, who heads the Jewish Leadership faction within Likud and challenges Binyamin Netanyahu's leadership of the party, issued a statement on homosexuality on his Facebook page, in a reaction to Thursday's "gay pride" parade in Jerusalem. "Homosexuality has long ceased to be a sexual deviation, belonging to individuals and their private lives, which no one wants to interfere with," he wrote. "They came out of the closet a long time ago and are now the spearhead of the 'post-' culture. We are dealing with the undermining of the family unit, which is the basic building block of every national society." "Throughout history," Feiglin explained, "from Rome to Europe in our day, the approval and spread of homosexuality presaged the decline of nations and cultures. If one reads the Torah portion 'Noah' – this comes as no surprise." "The organizers of a pride parade do not wish to gain rights. They strive to force homosexuality as a culture upon the public sphere." "A minority has no right to take over public assets. Let the marchers kindly go back to their individual closets. And let them do it without whining, because no one interferes with their affairs in there. Let them give up their attempts at takeovers, and leave the public sphere to normal people." Feiglin added in an additional post: "I have no problem with homosexuals, most of whom are, most likely, good and talented people and no one wants to interfere in their private lives. I have a problem with homosexuality as a culture. This culture subverts the status of the family. And without the family there is no nation, and without a nation there is no civilization."